Our House a.k.a. 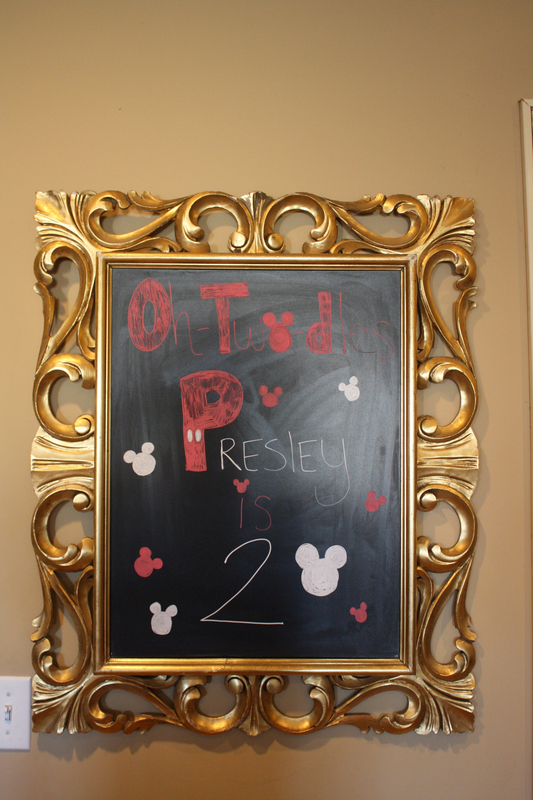 Presley’s Clubhouse | mrs. and the misc. 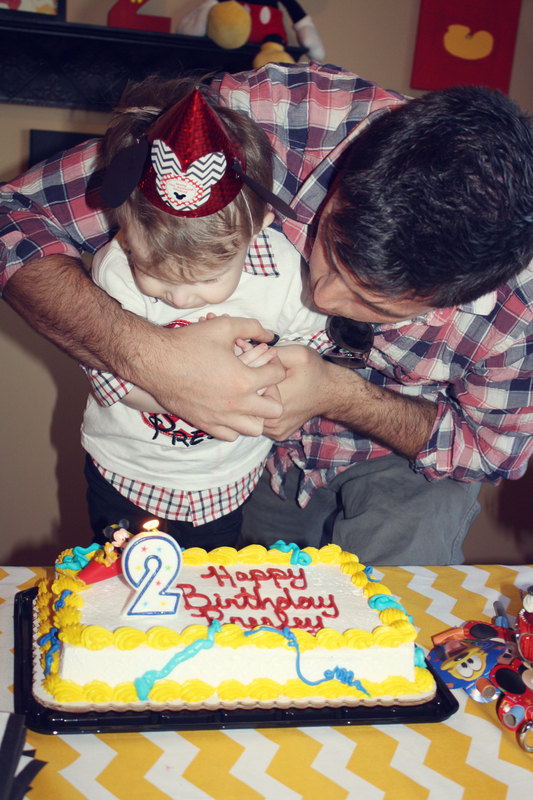 My scrumptious baby boy Presley turned TWO on February 12th! My oh my how the time flies. 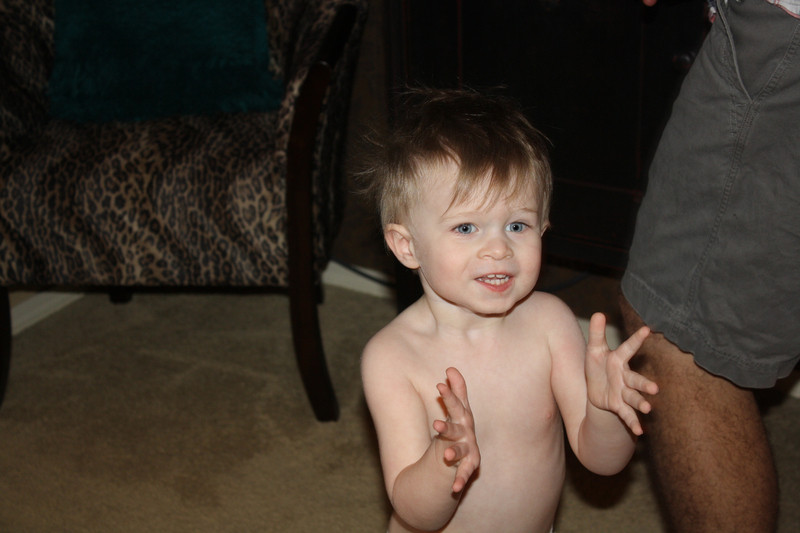 He is turning into the sweetest, most tender hearted little boy. He has a heart of gold and never meets a stranger. He can light up a room with his infectious smile and has the cutest random little accent when he says “Hi”. 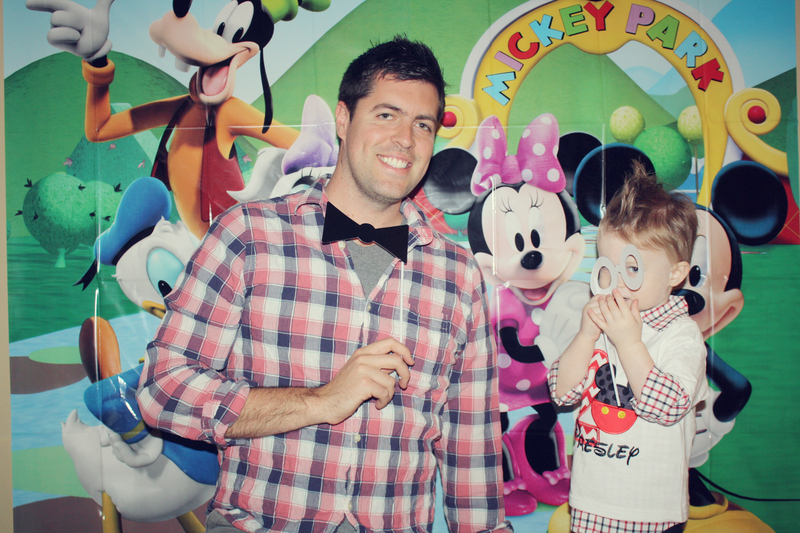 He adores Mickey Mouse so I knew we had to have a Mickey birthday. 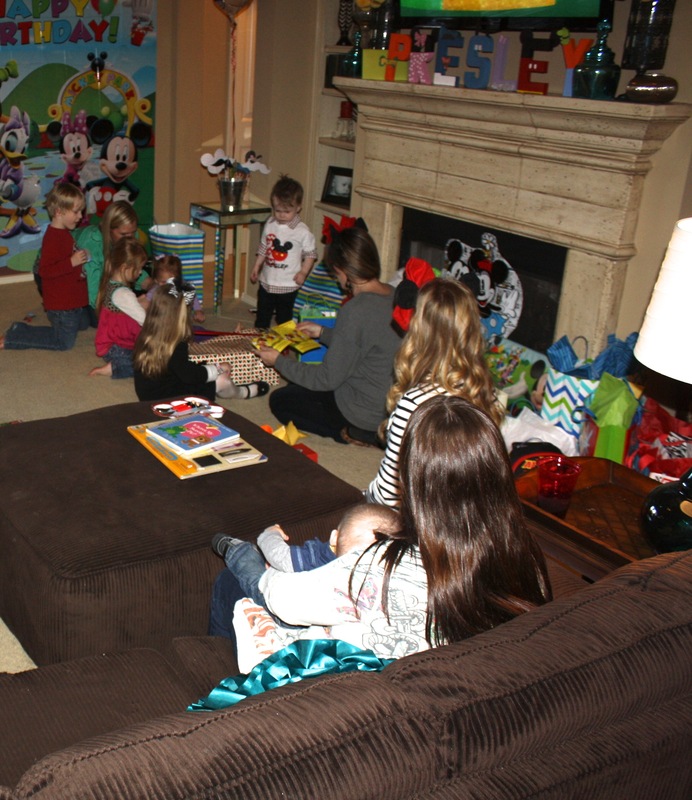 I started planning and before long it turned into an amazing birthday party with our family and little P’s friends! 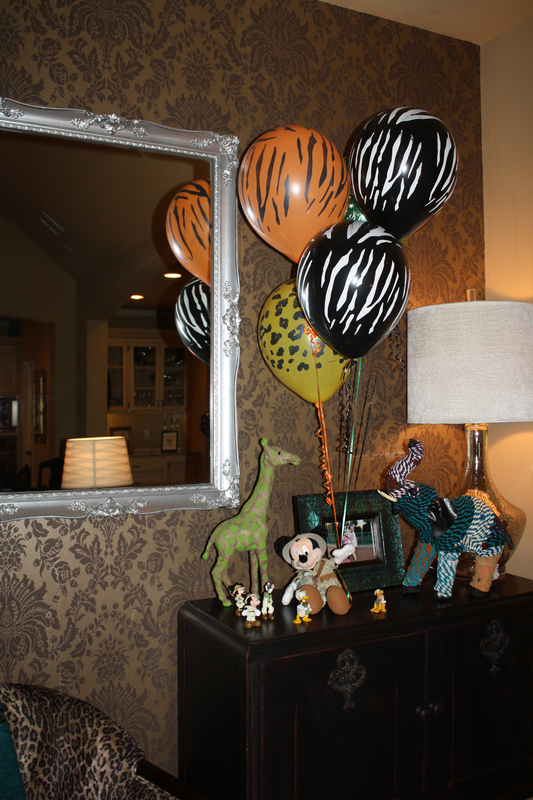 Everything turned out great and our house was turned into Presley’s Clubhouse! 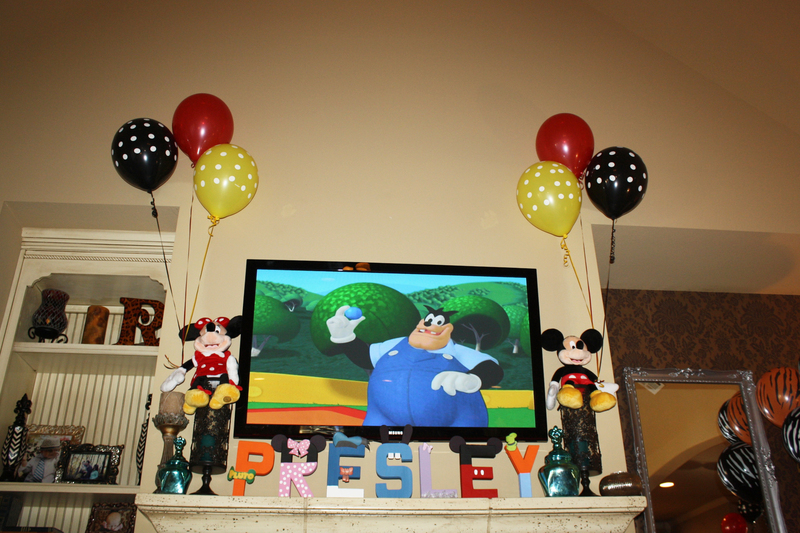 This was when Presley woke up from his nap and saw the house had turned into his very own Mickey Mouse Clubhouse! 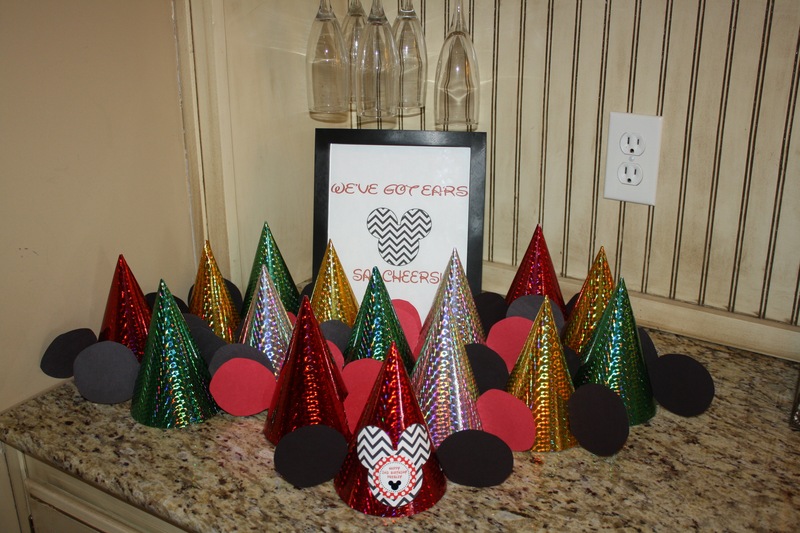 I had a blast making the birthday party hats! I just used construction paper and hot glue to make the ears! I also made Presley’s different and it’s the one in the front. 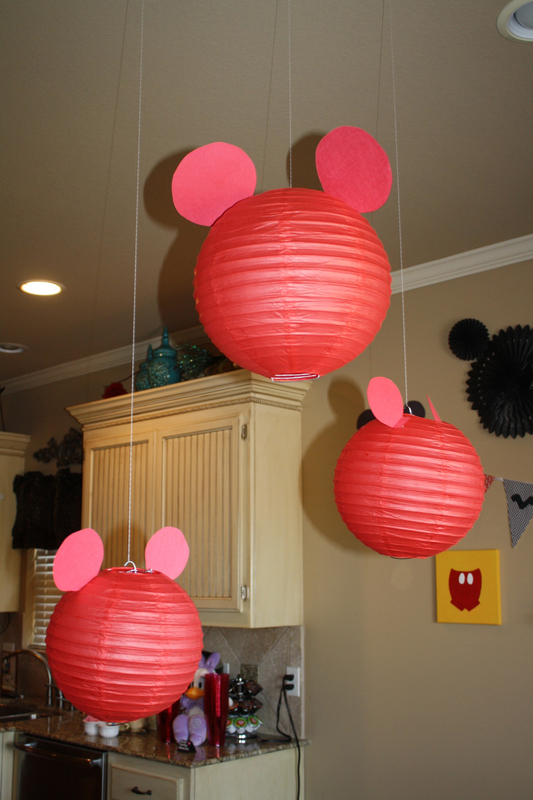 I added ears to these lanterns with construction paper and hot glue, just like I did on everything else! 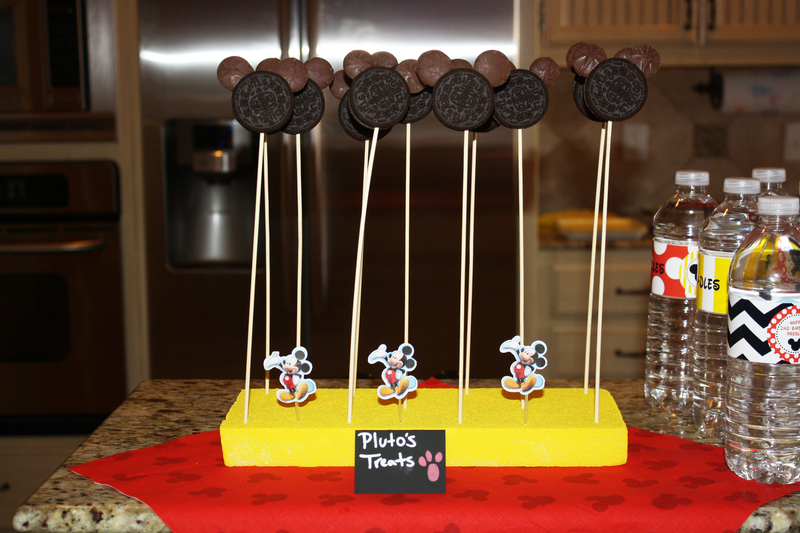 These Mickey cookies-on-a-stick were made with Oreo’s and Chocolate Chips. SO easy! 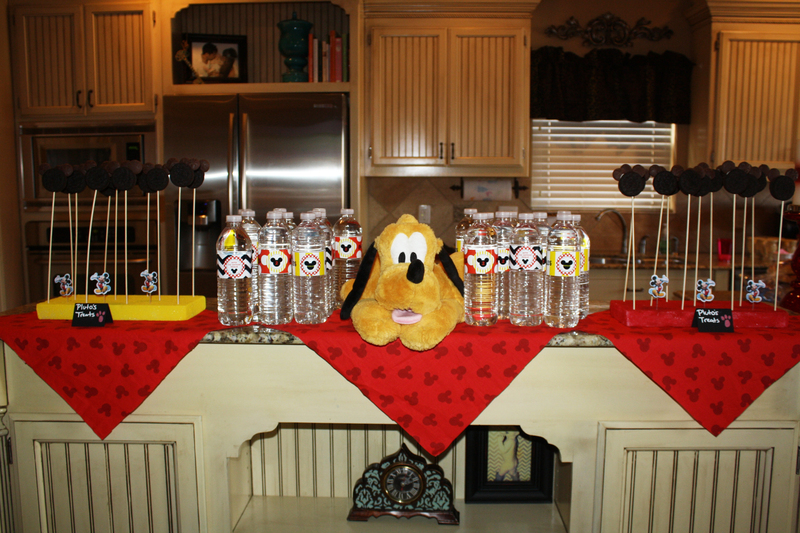 I love Etsy for lot’s of reasons…I always find cute water bottle labels for his parties and other little party touches that make my themes really come together! 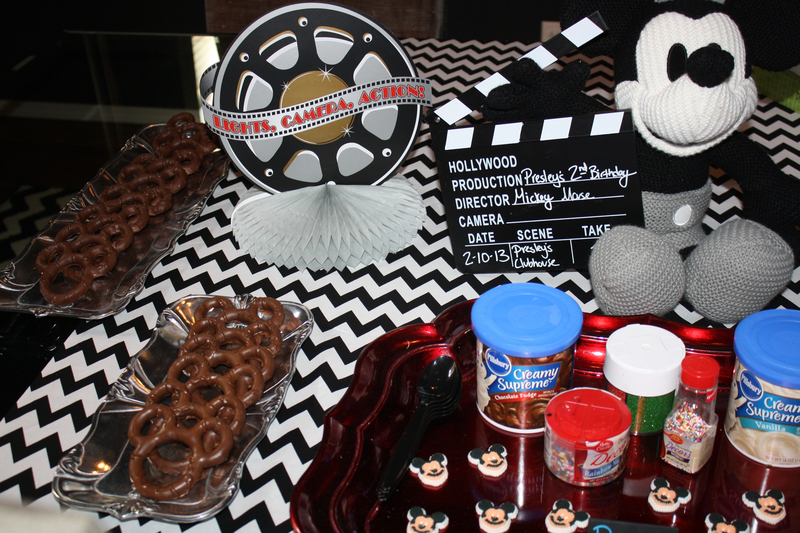 It’s always fun to have a photo backdrop for pictures at a party! 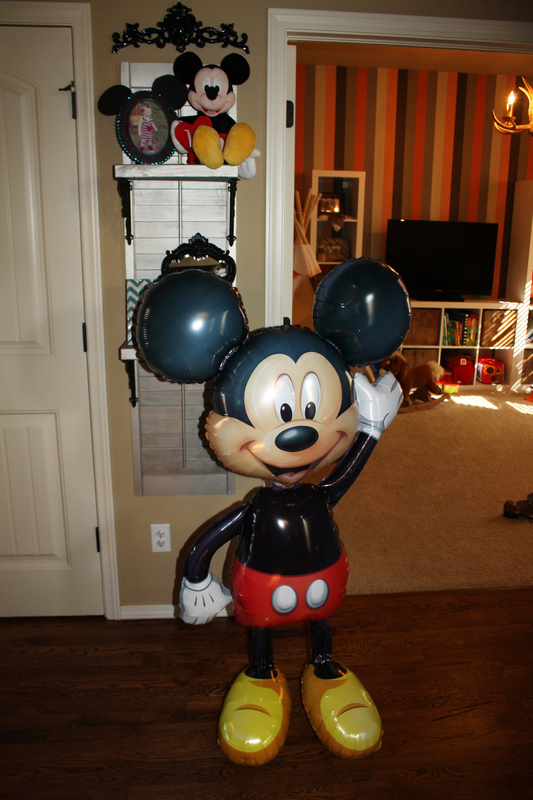 Party City always has cute Mylar Balloons that actually walk around your house because of the air and how they’re made. Still don’t understand how it works, haha. 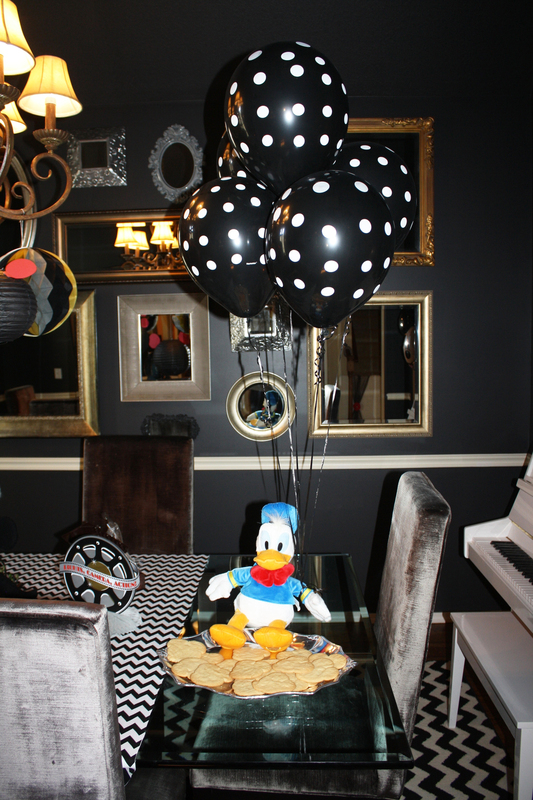 We made our dining room be the “Old Hollywood” Mickey theme. 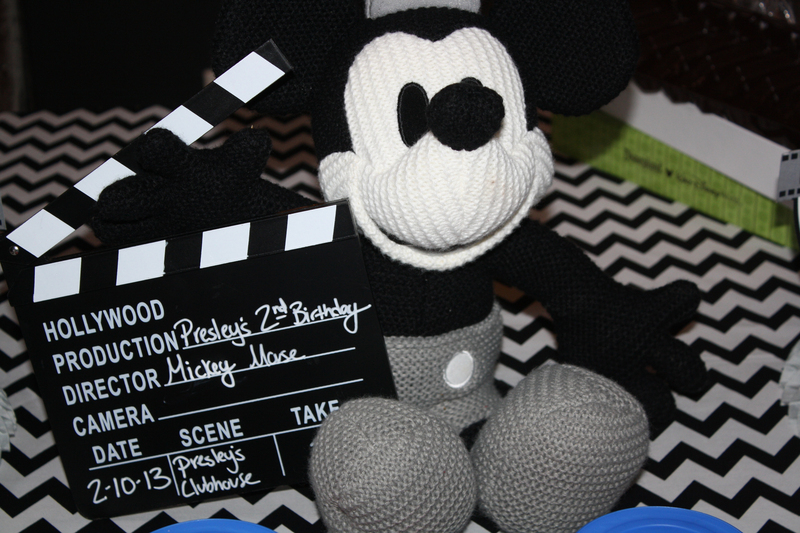 We found an original black and white Mickey for Presley when we were in Disney! I found cute Chocolate Covered pretzels in Disney too! 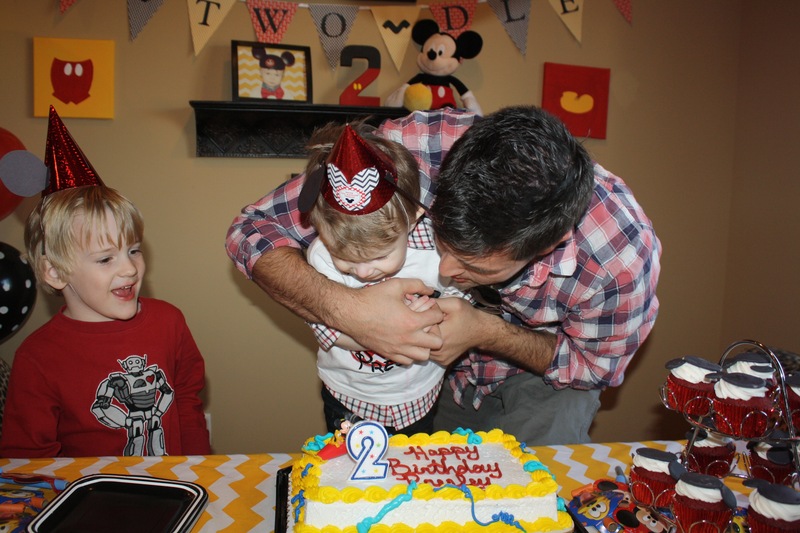 He LOVED having everyone sing “Happy Birthday” to him. Such a preshy boy! 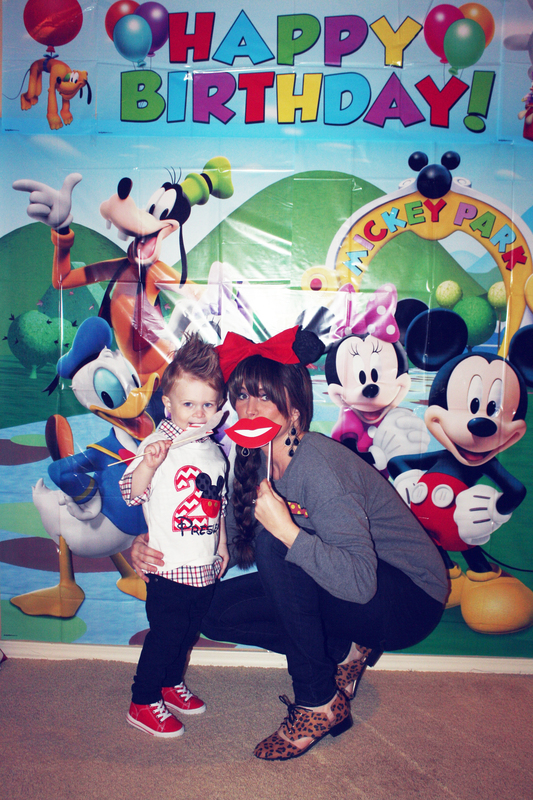 We had such a great time and I am already planning his 3rd Birthday!!!! I’m a planner what can I say ?!?!?!?! Absolutely AWESOME! All the details are just great. 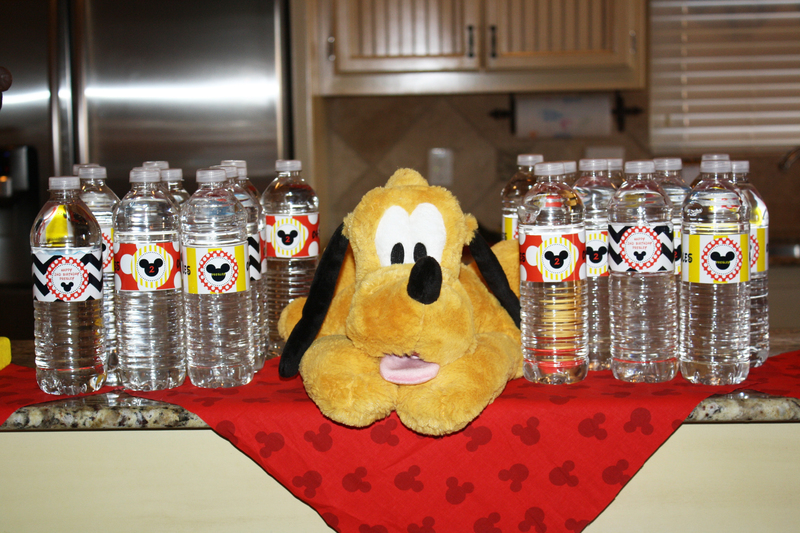 I especially love the Mickey Chinese lanterns and the custom water bottle labels. Well done! Mommy of the year for sure! Wow, you did a super job 🙂 I agree with you, party planning is fantastic fun! 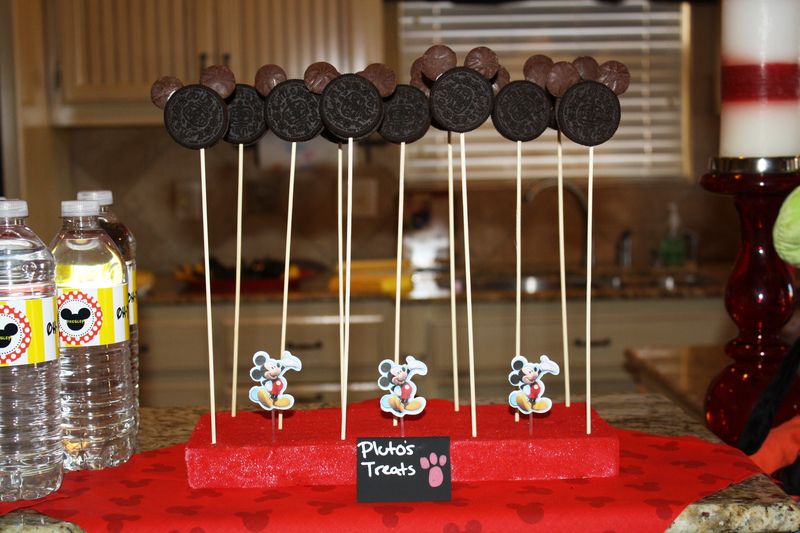 cute party, but what’s up with the cheap cake? 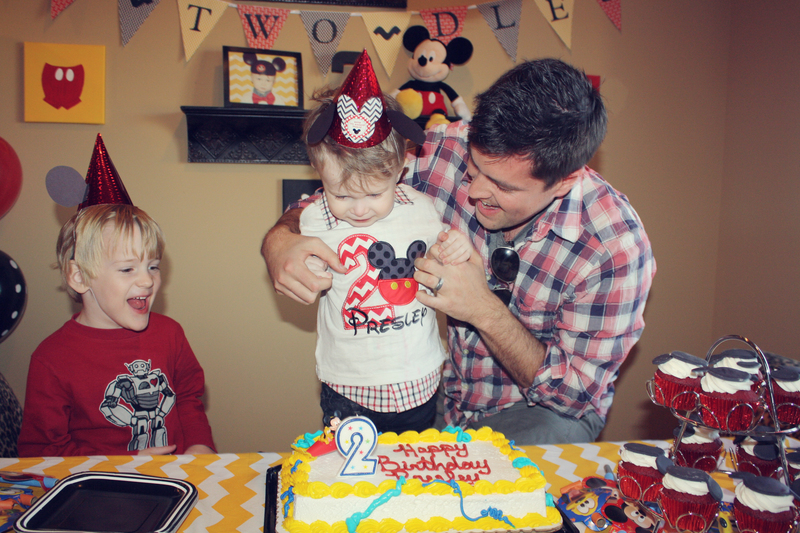 looks like lots of planning, so while you plan the 3rd bday party, don’t forget cake design. Yikes! That wasn’t very nice at all Barbara! 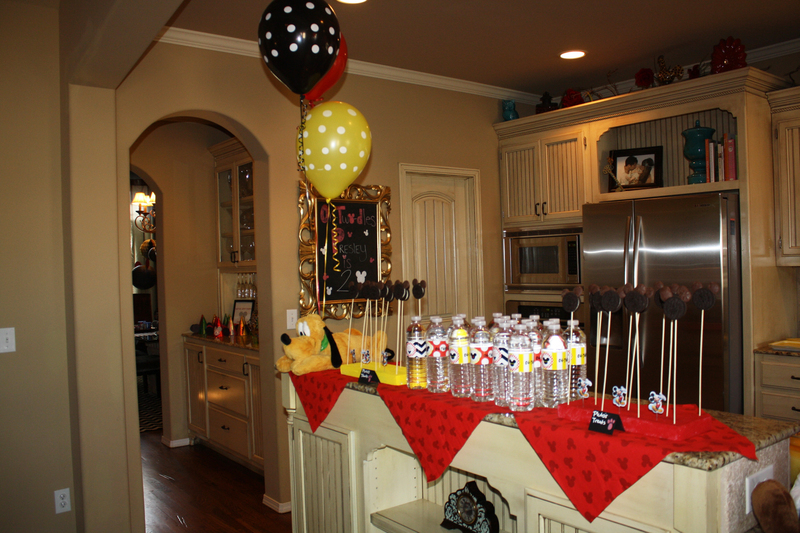 The party looks absolutely adorable. Who cares what the cake ended up like? What counts is that you had an awesome time with your beautiful boy and have these great pictures to treasure for years to come. Great job! omgoodness!! I LOVE this! 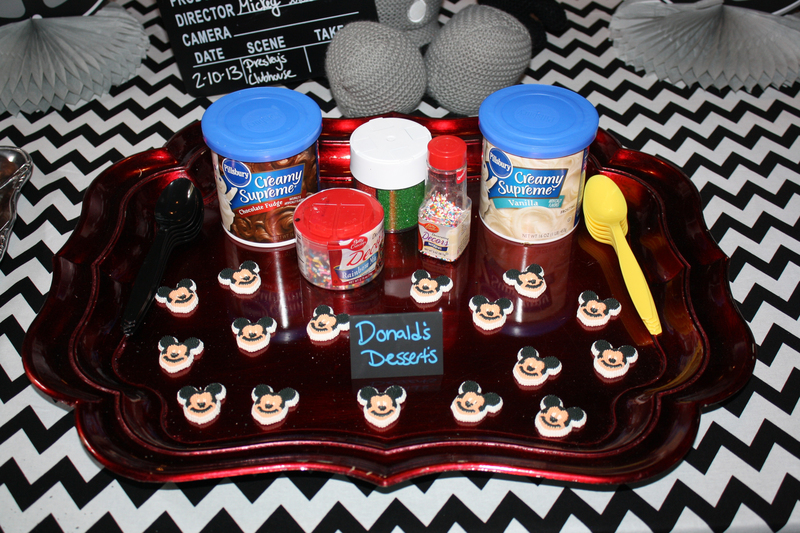 🙂 I have seen several Mickey Mouse parties, but this is the most creative! 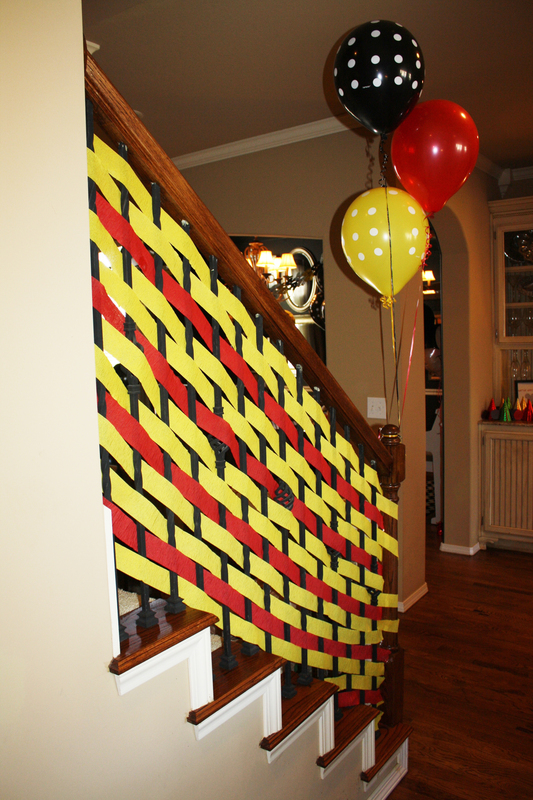 My favorites are the stairs & his sweet name that look like the characters from the show. 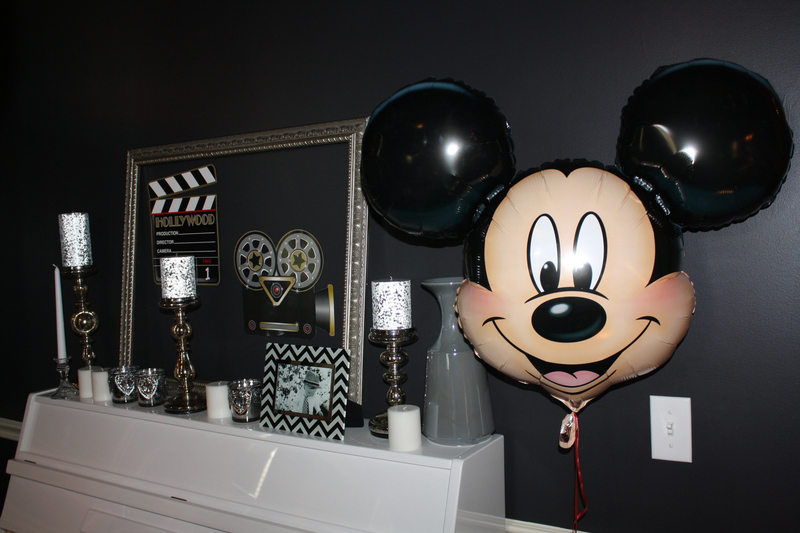 I always always have a movie playing to go with whatever theme my girls parties are, so I LOVE that the Mickey Mouse show was on 🙂 What a great idea to have the vintage mickey & safari mickey!! fantastic! 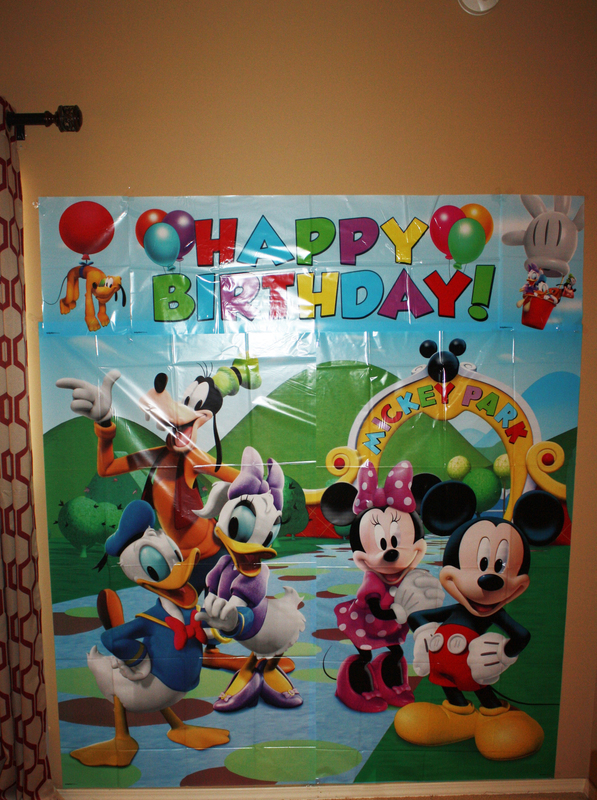 My littlest is turning 2 in May, so I am in FULL party planning mode. It’s my favorite thing to do. Love your creativity! 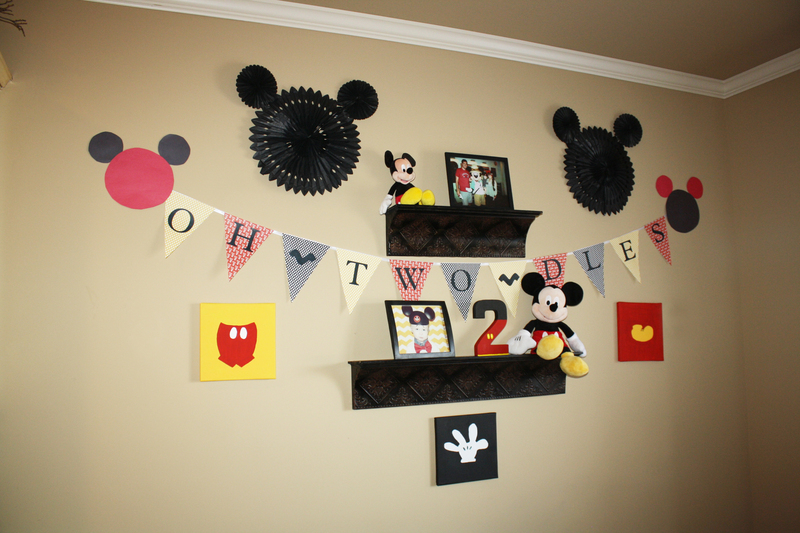 I’m actually planning my son’s Mickey Mouse party and came across your ideas on Pinterest. I’ve gone through many pages on etsy and cannot seem to find a shirt like Presley’s. 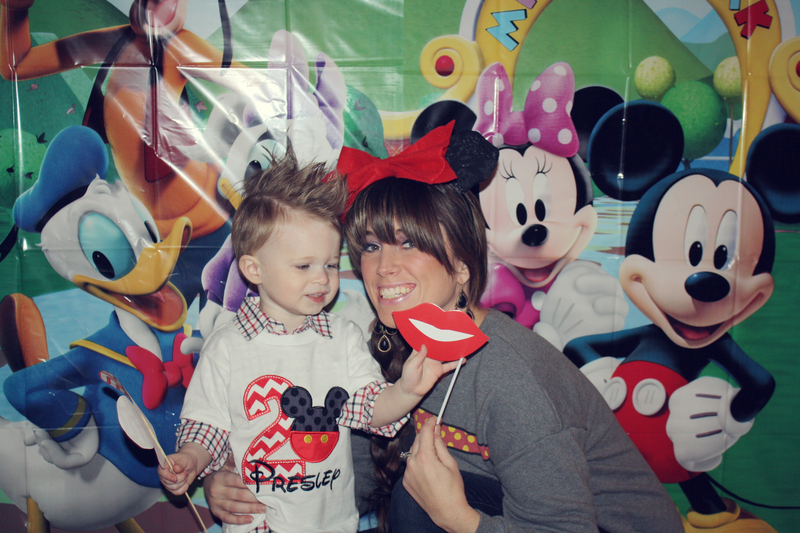 I love his shirt! May I ask where you got it from? Hi! Love the whole party! How do you do the pretzels? Is there an extra pin for that? Thanks! 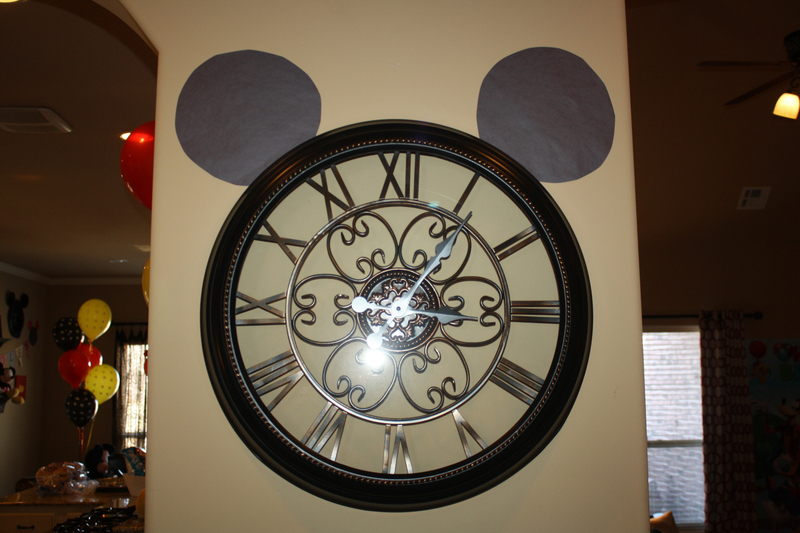 where did you buy the mickey mouse chocolate-pretzels?